Strengthen the underlying chest muscles for a natural breast lift. 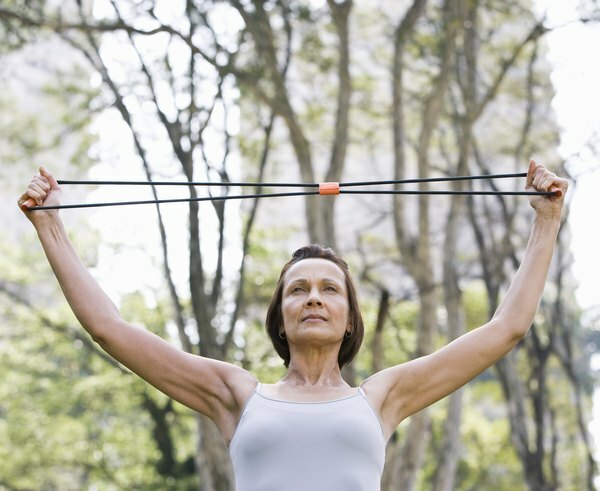 Resistance bands can provide an incredibly portable and effective strength training routine. 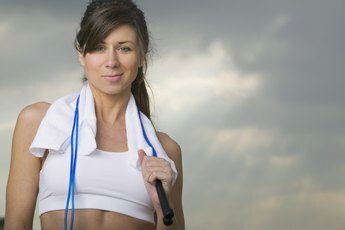 Instead of costly gym memberships and equipment, set your self up with a set of resistance bands so you can perform chest-toning exercises at home. In order to tone the breasts, you'll need to target the pectoralis major and minor muscles located underneath the fatty adipose tissues and connective tissue. Squeeze in a chest workout using resistance bands and a sturdy chair while you're catching up on your favorite television show. Wrap an exercise band around the back of a chair. Sit up tall on the chair with your back resting against the backrest. 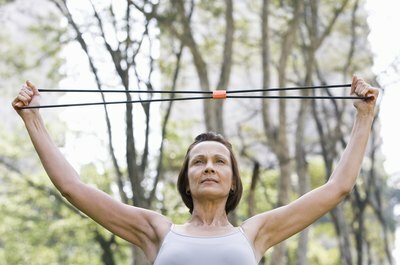 Hold onto both ends of the resistance band. Tuck your elbows into your sides and place your hands in front of your shoulders, palms facing out. Press forward with both fists, as if you were trying to push open a heavy door. Extend the arms fully as shoulder height. Bend the elbows by your sides and return to the starting position with your fists in front of your shoulders. Wrap a resistance band around the back of a chair. Sit up tall with your spine against the back of the chair. Grab hold of each end of the resistance band. Extend your arms out in front of you at shoulder height, palms facing each other. Bend your elbows and open your arms away from each other in a wide semi-circle. Keep the arms at shoulder height the entire time as you circle them open. Press the arms back together, repeating the semi-circular arc. Wrap a resistance band around the soles of your feet. Grab hold of both ends of the resistance band. Tuck your elbows into your sides and position your fists in front of your shoulders, palms facing each other. Extend your arms fully above your head, making a straight line from your wrists to your shoulders. Bend your elbows and lower your arms back down to the starting position. Hold a resistance band with both hands in an overhand grip. Create a 1-foot distance in between your hands. Hold the band horizontally in front of your chest, arms fully extended. Pull the band in opposite directions, as if you were trying to rip the band apart. Hold for three seconds and release. Perform at least 150 minutes of moderate cardiovascular activity every week in addition to resistance band exercises. Focus on aerobic activities that target the chest, such as swimming, rowing, cross-country skiing, tennis and basketball. Speak to your doctor before beginning a new exercise program.